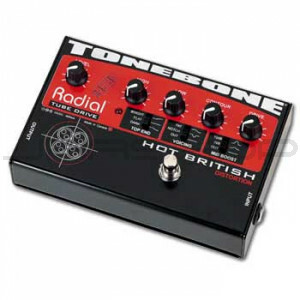 The Tonebone Hot British is distortion at its best! From fat hot-wired Marshall tones to the huge scooped out mid sounds, the Hot British is blistering brute force extraordinaire! Based on high-gain amplifier designs, the Hot British is tailored to extract ultra-rich harmonics and full-on saturated tube settings without the mud or noise that is typical with other pedals. The powerful EQ settings truly allow the player to dial in to the type of tones that create everything from chunky rhythms to sizzling lead solos. Best of all, even when pushing the Tonebone Hot British beyond the limits, the natural dynamics and feel of the player still shines through.